RAM LPG Regulators guarantee a stable and precise adjustment of outlet pressure, thanks to correct design of the membrane/ lever/spring system and thanks to the two pressure reduction stages with servo-circuit. This allows to maintain a constant pressure at the outlet, independently of LPG conditions in tank and/or engine loads and rpm. A water/gas heat exchanger is realized in two chambers, divided by an aluminium wall only, without any gasket to avoid any leakage of water into gas and viceversa. It provides the heat necessary for liquid LPG vaporizing. The wide range of LPG pressure reducers, proposed for any request and application, is classified into two regulators families (STD and HP), developed for two different power ranges. For any family, RAM Regulators proposes versions with different accessories and all of them are available with ECE R67.01 homologation. 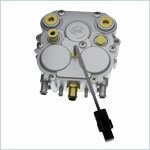 The Radium 01L has not any solenoid valve, so it requires the installation of a “cut off valve” in the liquid LPG line. 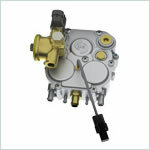 The Radium 02L has a solenoid valve in Low pressure side, which avoids to have overpressure in the gas line upstream the injectors, when switching from gas to gasoline. 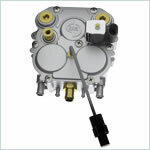 The Radium 03L has a solenoid valve with filter at reducer inlet. This avoids to have overpressure inside the reducer, when switching from gas to gasoline. The installation of any filter, in the liquid LPG line, is avoided. 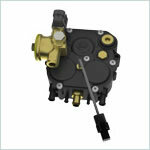 The Radium 04L Black has a solenoid valve with filter at reducer inlet. This avoids to have overpressure inside the reducer, when switching from gas to gasoline. The installation of any filter, in the liquid LPG line, is avoided.